Mia Adams is a high school student and member of a School on Wheels Club at her school. She spends her evenings tutoring children. Mia is being mentored by SOWMA board member and tutor Carol Augustyniak Marcus. Mia wrote this piece for "The Daily Olivian," the official newspaper of Oliver Ames High School. This matters to me. And I hope it will matter to other students too. Last year I started tutoring homeless children for School on Wheels, and it truly changed my life. But there was one instance that affected me the most and left me with the most rewarding feeling I have ever experienced in my life. After my third or fourth week of tutoring one fifth-grade girl, I thought she would like some additional school supplies. Before the next session, I put together pencil cases full of all new school supplies for her and her two younger siblings. Filling the pencil cases for the children was just an instinct for me, and I didn’t think that deeply into it. ...met at Tufts University as graduate students in the biomedical science program. When they graduated last May, 2018, they began the arduous process of applying to dental (David P.) and medical school (David G.). One night last summer, as they listened to David’s mom talk about her experience as a longtime SOWMA tutor, an epiphany struck. Leslie Dougherty described the many ways in which her life has been enriched by the students she meets each week at a family shelter in Brockton. Her anecdotal stories resonated deeply and by the time dessert was served that hot summer night, they each decided to begin tutoring this fall in Brockton, travelling from Boston every Monday night to help a student with homework. Three months later we asked, What’s your favorite part of tutoring? Hats off to these two aspiring doctors, who prescribe all the right medicine every Monday night. Our staff meetings begin with each of us describing a recent “mission moment.” These exchanges range from a staffer who described welcoming 8-year-old twins, who arrived carrying new backpacks they gathered in lieu of birthday gifts, to another recalling the expression of a young girl who tried unsuccessfully to hold back tears as she was handed school materials sporting her favorite color or Disney theme. Always there's a heartwarming story from a tutor or mentor, whose student has just begun to read on his own - or who recently passed the GED. My mission moments were plentiful during a recent School on Wheels opening at Pilgrim’s Hope, one of our new tutoring locations in Plymouth, Massachusetts. It was I who held back tears as 6thgrader Mollie opened her new backpack and tore through the freshly-packaged contents in search of the gem – her new reading book. Mollie shrieked with delight as she pulled out the popular “A Fault in Our Stars.” Her mother was equally excited and pointed out that her eldest daughter had recently begun reading that very book, but had to return it to the local library just as she neared the middle of the story. Mollie was one of more than a dozen children who, together with their parents, joined us on this summer night in Plymouth to learn about our work, receive school materials, and sign up for our one-on-one tutoring program. 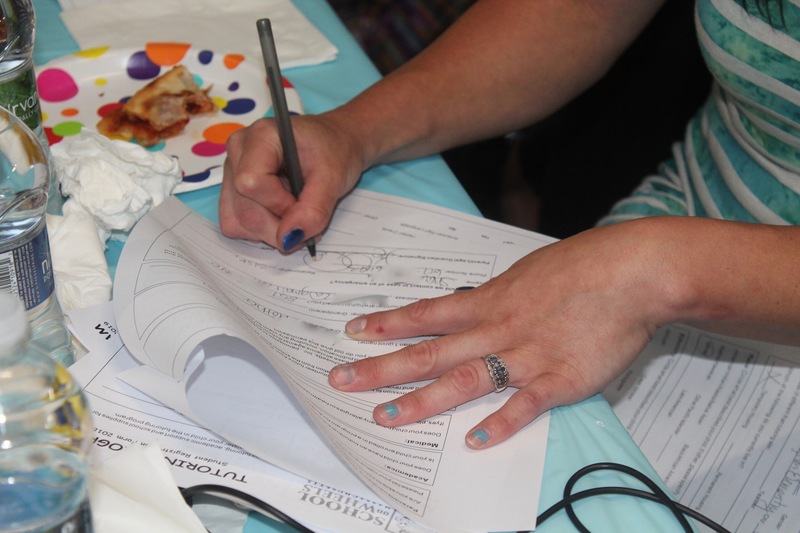 Registration took place in a bright and cheerful education room at the place these children call home. Suzanne Giovanetti, CEO of the Plymouth Area Coalition for the Homeless, welcomed School on Wheels staff and helped usher in the trunk-load of customized backpacks labeled with each child’s name and grade and packaged accordingly. Another mission moment surfaced that night during the dedication of the School on Wheels' Jennifer Kane Memorial Lending Library, namesake of the Plymouth resident who lost her life on September 11, 2001 while working in the World Trade Center in New York. This Lending Library is brimming with new books, courtesy of Scholastic Books and Houghton Mifflin Harcourt - and sponsored by Jennifer’s parents, George and Faye Kane. 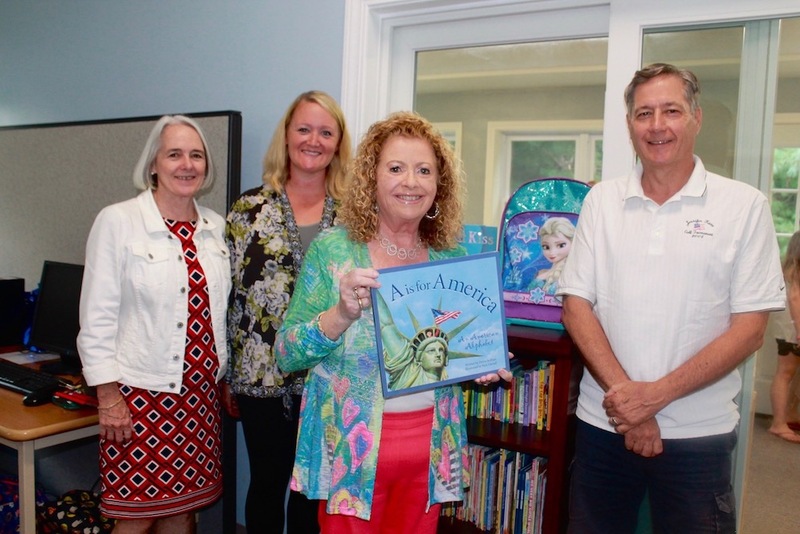 “A is for America” is tonight’s book of honor, a loving tribute to the Kane family and presented to the Lending Library by longtime friends of the Kane’s, Pat and Michael Sullivan. Jennifer Kane, Pat explained, was an avid reader and strong proponent of literacy - and she was the first to lend a hand to a child in need. It was a fitting tribute. Soon the children are scattered about the floor, eagerly exchanging colored notebooks and pencil cases reminiscent of my own childhood exchanges of Snickers and Skittles on Halloween night. It’s mission moments like these where I find myself saluting sponsors like the Stratford Foundation, the Blue Hills Bank Foundation, Cape Cod 5 Foundation, the United Way of Greater Plymouth County - and you - who collectively helped to make this community a new home for School on Wheels. Below: Children exchange treasures, Suzanne Giovanetti with Kathleen Graham, and Pat and Michael Sullivan, a parent registers for tutoring, the Jennifer L. Kane Lending Library. Welcome to our New Executive Director Kathleen Graham! We are thrilled to announce the appointment of Kathleen Graham as our new executive director. 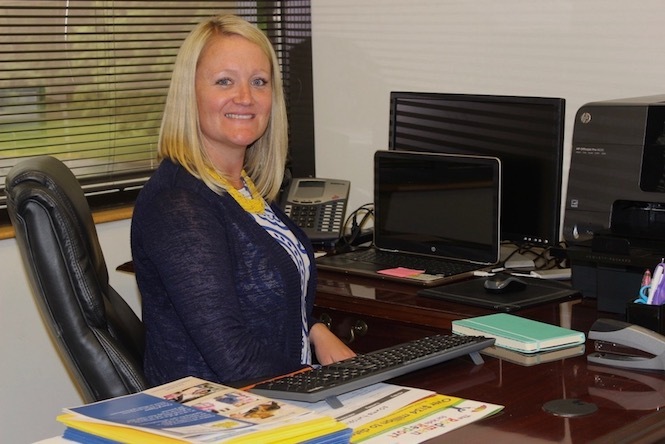 Kathleen will take over for our Founder and Executive Director Cheryl Opper, who started the organization from her home in Easton, MA in 2004 after reading a magazine article about a woman who started a School on Wheels in Los Angeles to help homeless children. Throughout the past 14 years, Opper has grown the organization from a handful of volunteers who assembled backpacks in her basement and offered tutoring at two family shelters in Brockton, to a leading charity that addresses the educational needs of some of the 21,000+ children and youth throughout the state who are experiencing homelessness. 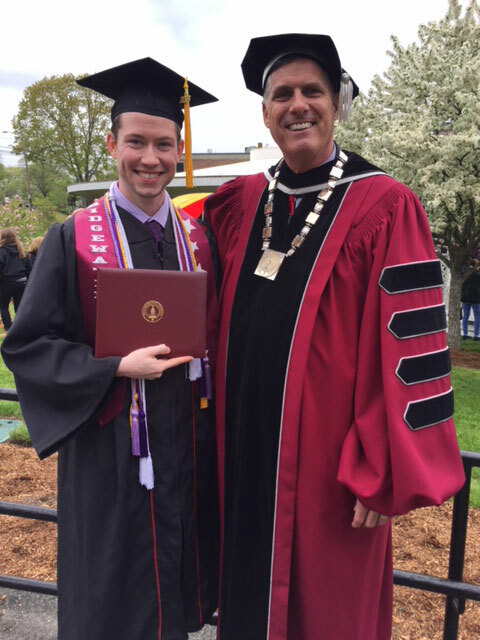 SOWMA student and BSU Scholar Zachary celebrates his graduation with Bridgewater State University President Frederick W. Clark. Zachary faced many hardships growing up, including homelessness, but always stayed focused on his education. He will continue his studies at the University of Houston, where he plans to pursue a master's degree in applied financial mathematics. This year Zachary was inducted into the National Mathematics Honorary Society (Pi Mu Epsilon). 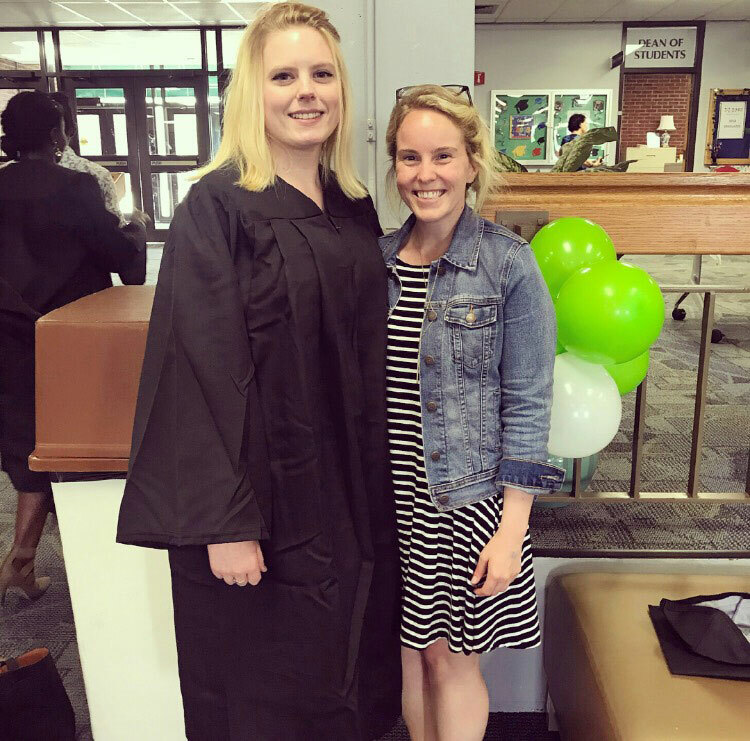 SOWMA's High School Plus Coordinator Cassandra Dockray always knew she would one day stand alongside SOWMA student Apryl at her graduation. Here they celebrate Apryl's accomplishments and associate's degree from Massasoit Community College. Apryl is heading to Bridgewater State University this fall - with the support of Cassandra and SOWMA's High School Plus program. 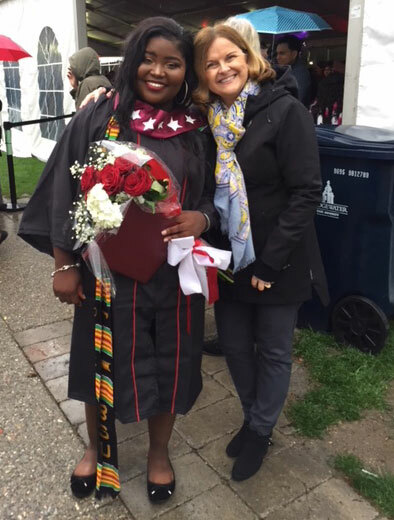 SOWMA mentor Beth Young met Ana when she was facing homelessness and motherhood as a high school student in Brockton. The two met regularly throughout Ana's high school and college years. 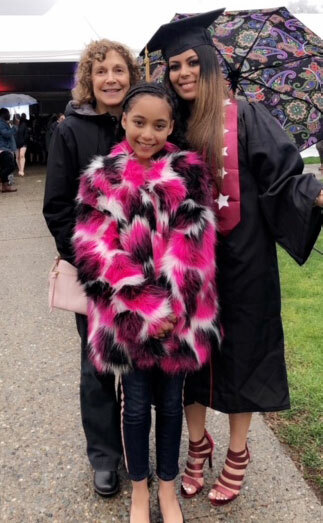 Last month Ana's daughter Briana proudly watched as her mother received her BSU diploma in social work. Briana has been a SOWMA student since kindergarten and is looking forward to holding her own college diploma one day! 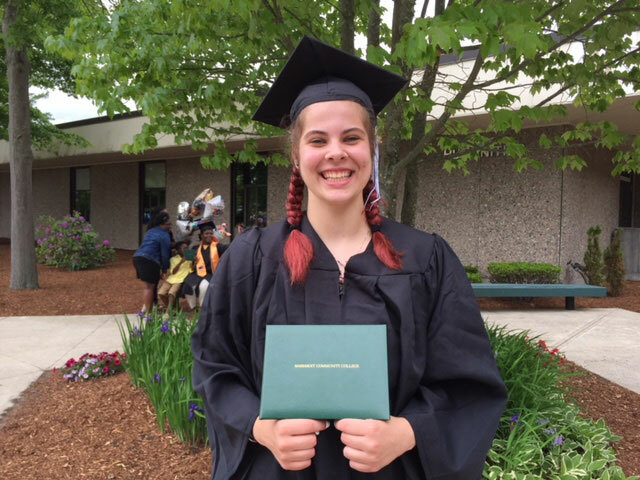 Jessica is beaming with pride at her Massasoit Community College graduation. This fall she will attend Salem State University to study early childhood education. Jessica has been a SOWMA student since 7th grade. We know that she'll make the best teacher and role model as she pursues her bachelor's degree. Sefora, a BSU Scholar has been a SOWMA student since her senior year at Brockton High School. She is all smiles with Cheryl Opper on her graduation day. 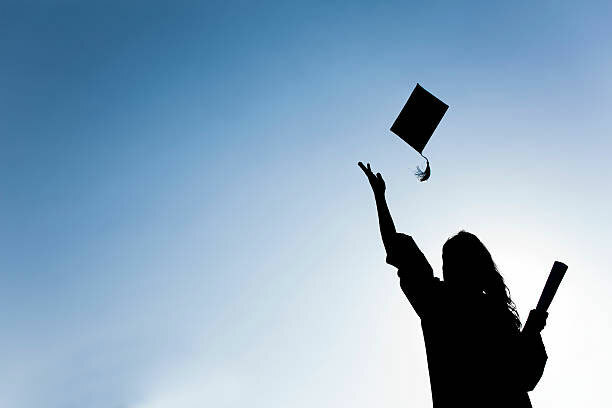 Sefora plans to attend graduate school after obtaining experience in a managerial role at a health care agency. Shantaria is camera-shy but her accomplishments are loud and clear after successfully completing her associate's degree at Massasoit Community College. She's off to BSU this fall to study social work.